Australia opener Marcus Harris has led from the front on day one of the second Test, and a crucial knock from Travis Head late on has strengthened Australia’s position against India in Perth. At stumps, Australia was 6-277 with Tim Paine unbeaten on 16 and Pat Cummins 11 not out. Any concerns that the new Perth Stadium would be devoid of the life and bounce of the old WACA wicket were put to bed as India’s four-pronged pace attack unleashed some nearly unplayable spells to kick off the second match of the series. It was local favourite Harris, who currently represents Victoria, who resisted with the composure and resilience of a far more experienced Test batsmen to amass 70 runs, before the lively pitch claimed his wicket. Harris clubbed 10 boundaries in an innings that gathered pace after a watchful start, showcasing his tremendous driving technique. 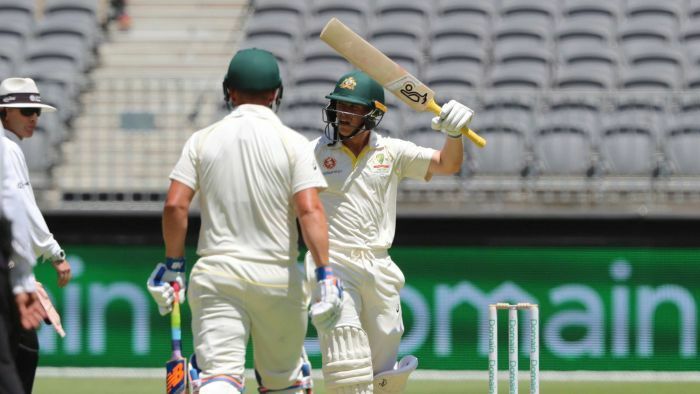 Aaron Finch (50) responded to the pressure surrounding his position as a Test opener with a composed, anchor-role half-ton, contributing to a century partnership for the opening stand alongside Harris. But after surviving a raucous appeal for LBW, Finch would fall a ball later, trapped plumb in front of his stumps with a low-hanging Jasprit Bumrah (1-41) delivery. Harris would fall soon after, edging a delivery that took off from the turf from part-timer Hanuma Vihari (2-53), prompting an excellent catch from Ajinkya Rahane in the cordon. Usman Khawaja (5) had come to the crease and looked out of sorts for much of his brief stay, edging an uppish Umesh Yadav (1-68) ball through to the keeper. But the catch of the day belonged to India’s star captain Virat Kohli, who leapt expertly to pouch a rapid edge off Peter Handscomb’s (7) bat, diving to his right in a moment of high quality. Shaun Marsh (45) and Head (58) would engineer a middle-order recovery for the hosts with a partnership of 84 runs thanks to patient run accumulation. But Vihari would snare another wicket for the day when he found Marsh probing, producing an edge to Rahane again at slip. From there on, Head took control, maintaining a strong run-rate alongside Paine while notching up another half-century for the series, as Australia’s score became increasingly healthier. But no sooner had he established himself, Head took a swing at a wide Ishant Sharma (2-35) delivery that skied over to the fielder at third man, as India claimed a sixth wicket. Paine and Cummins closed out the day, defying a frustrated Bumrah who deserved more than his solitary wicket, to leave Australia in a good position heading in to day two.